Ever since I returned from visiting Bang & Olufsen's factory in Struer, Denmark (footnote 1), and listening to a final prototype of the BeoLab 90, I've wanted to hear it againthis time in my own home. Sure, I heard the production BeoLab 90 at its unveilings at a 2015 press event in NYC and the 2016 Consumer Electronics Show, but only in uncommonly large rooms. While the sounds in those space seemed to impress others, I was haunted by memories of what I'd heard in Denmark. Then, last spring, by chance, my wife and I happened on B&O's London showroom. A brief listen to the BeoLab 90s there confirmed that they were something specialno, something uniquethat should make a big splash in the audio world. Yet I saw no print reviews in the US audio press, and barely any ripples on the Web. This must not stand. The raison d'être of the BeoLab 90its name refers to B&O's 90th anniversary, observed in 2015is its designers' efforts to control the speaker's radiation pattern throughout the audioband, thereby minimizing the listening room's influence on the direct sounds from the speakers. A brief reminder: In addition to the soundwaves a pair of speakers beam directly at our ears, the waves of sound spread more widely throughout the room, and are reflected off all of its surfaces, to arrive at our ears slightly later: all that bouncing around takes time. If the delay is relatively shortthat is, if the soundwaves are reflected off a surface close to the speakerthe listener doesn't hear the reflected sounds as coming from a separate source, but as a temporal and spatial smearing of the direct sound. In addition, various types of surfacea hard, flat wall, shelves filled with books, etc.will reflect some frequencies better than others, ultimately affecting the direct sound: even soundwaves that are only briefly delayed by reflection can corrupt tone and timing when they and the direct sounds from the speakers combine at the listener's ear. Anechoic or even highly deadened rooms are no solution, as we depend on the later reflections to provide a generous and wide soundstage. A live-end/dead-end (LEDE) setupin which the speakers stand at the Dead End, surrounded by highly absorbent surfaces, and the listener sits near the Live End, surrounded by more reflective boundariescan quash briefly delayed reflections while leaving longer-delayed reflections intact. Of course, that presumes that the speaker's off-axis radiation and the room's absorptions and reflections all behave in an equal and linear fashion across the audioband. Which is a big presumption. Take a look at John Atkinson's "Measurements" sidebars, which accompany every review of a loudspeaker published in Stereophile, and read through his graphs of lateral and vertical dispersion to see the range of variation in performance. With almost every speaker tested, the frequency response of the speaker's off-axis radiationthe soundwaves reflected from the room's near and far surfacesdiffers from the direct, on-axis frequency response. Some off-axis responses are non-linear, but in almost every case the difference between the off- and on-axis radiations varies with increasing frequency from the low midrange up. Such behavior almost ensures an unfortunate in-room response. For decades, B&O and other manufacturers have tried to design speakers whose off-axis radiation is as smooth as their on-axis, direct sound. We have seen external pads of absorbent materials, narrow and/or curved front panels, and pyramidal and boxlike enclosures stacked like the Towers of Hanoi in attempts to minimize box reflections and edge diffraction. 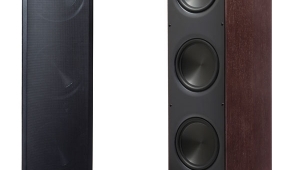 We have seenand still seehorn loading and acoustic lenses, but extending the outputs of speakers so equipped down into the lower midrange comes with complications. We have appreciated that dipole speakers, through the interference of their front and rear radiations, cancel laterally dispersed soundwaves and mitigate some room effects. Given carte blanche in celebration of the company's 90th anniversary, B&O's engineers mounted a full frontal attack on these challenges. The goal was a speaker with a smooth on-axis frequency response that also had the same off-axis response over a specific lateral span, and little or no output beyond that span. 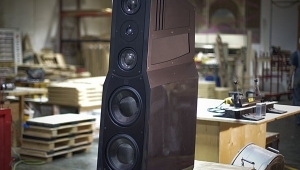 The 18-driver loudspeaker that resulted is very roughly triangular in cross-section, and vertically tapers from its wide bass cabinet to a smaller midrange box to a still smaller tweeter enclosure. Each individual enclosure contains multiple drivers, and each driver has its own DAC and ICEpower class-D power amplifier. However, the heart of the system is a DSP engine that controls all of the drivers individually. Three front driverswoofer, midrange, and tweetercomprise a more or less standard three-way system, to be aimed directly at the main listening position; for these, the DSP engine provides a phase-correct, three-way electronic crossover. 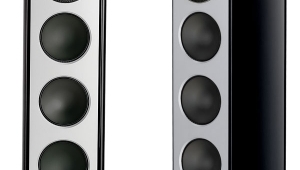 For the remaining 15 drivers per loudspeaker, it provides signals whose content depends on the setting of the speaker's Beam Width Control: Narrow, Wide, or Omni. 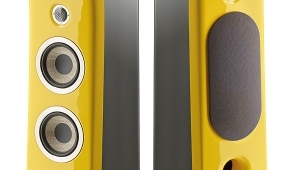 At the Narrow settingwhat might be called the "audiophile" Beam Width modeeach driver gets a highly specialized, bandwidth-limited, phase-controlled signal that has one task: to interact with the acoustic output of the three front drivers, so as to redefine the BeoLab 90's off-axis radiation at all frequencies. Thus, each of these 15 drivers will be summing or interfering with the off-axis radiation at different frequencies, to reshape the dispersion to be uniformly controlled over most of the audiobandmuch as a sculptor might add clay at one place and remove it at another. The BeoLab 90's DSP and multiple drivers also allow the user to change the speaker's radiation axis, directing its output at different listening positions using the Beam Direction Control, and to implement Active Room Compensation. I didn't try the former; the effects of the room equalization are described below. 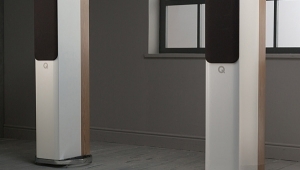 The appearance of the BeoLab 90 is pleasantly domestic. While the speaker is undeniably big, the use of multiple curved panels of fabric and wood, with aluminum accents, distinguishes it from the monolithic appearance of most large speakers, even those that have some curved contours. The BeoLabs didn't overwhelm my 24' by 14' room, nor did they change the overall feeling of the space. Instead, they became a welcome design element (footnote 2). Setting up the BeoLab 90s required more brute force than sophisticated tweaking. Three B&O employees unboxed and positioned the large, heavy speakersone hopes that a regular purchaser would receive at least as much consideration I did. They used a custom-made trolley to move each speaker into positionthe only constraint was that we wanted the BeoLabs equidistant from and aimed precisely at my head as I sat in my preferred listening spot. 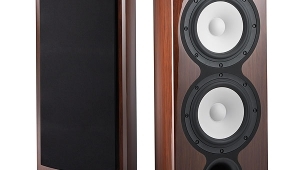 Their considerable size meant that each BeoLab 90 ended up less than 18" from a sidewallbut if the raison d'être of B&O's Controlled Beam Width is relief from room influences, positioning shouldn't be critical. 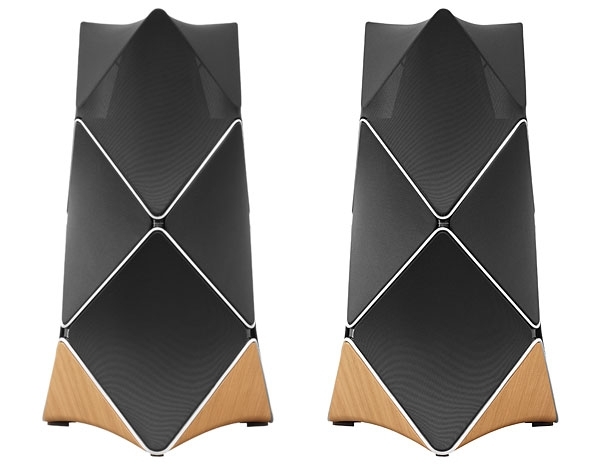 Each pair of BeoLab 90s comprises a Master and a Slave (B&O's terms). The Master speaker was connected to my home network with one CAT7 Ethernet cable, and to the Slave by another. Since the speakers sat at the opposite end of the listening room from my Baetis music server, I needed long cables. Sure, I could have used the long XLR cables that usually run from my equipment rack to my power amps, and let the BeoLab 90 convert their analog signals to digital at 24-bit/192kHzand I did use the analog RCA outputs of my exaSound e28 DAC directly, as well as the analog XLR outputs of my Parasound Halo P 7 preamplifier. But unless I want to play vinyl (which I don't), why not send the digital source, to avoid unnecessary D/A/D conversions and any attendant variables? Well, long runs of digital cables are problematicUSB tops out at about 16' without active drive, and S/PDIF is usually unhappy with really long runs. I asked for help from two sources. First, Baetis's John Mingo hooked me up with Shunyata Research, who sent along 30' of their Anaconda S/PDIF BNC-to-RCA cable and assured me it would do the job. It did. Second, I asked Corning Optical for their shortest (10m!) USB 3.0 optical cable. Unfortunately, the BeoLab 90's USB input was not yet functional at the time of my listening, so I arranged to borrow a Peachtree Audio X1 USB-to-S/PDIF converter. Not so fast! Corning's optical USB cable doesn't carry the 5V required to power the Peachtree X1. So I added to that run an UpTone Audio USB ReGen, with its independent power supply. I now had two routes to the BeoLab's S/PDIF input: one from the server's S/PDIF output via the Shunyata cable, and the other from the Baetis server's USB output (footnote 3) via the Corning cable, the UpTone USB ReGen, and the Peachtree X1. Both hookups worked. 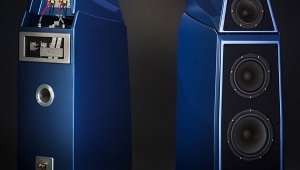 Footnote 1: See "Industry Update" in Stereophile's October 2015 issue. Footnote 2: The BeoLab 90's 42-page manual states that it was designed by Thorsten Frackenpohl and André Poulheim, who, I assume, are responsible for the speaker's handsome appearance. However, I believe that at least equal prominence should be given to those at B&O who were in charge of its technical development and implementation: Gert Munch, Technology Specialist in Electro Acoustics; Jakob Dyre, Technology Specialist in Electro Acoustics; Geoff Martin, Tonmeister & Technology Specialist in Sound Design. Footnote 3: By means of its accessory SOtM tX-USBexp. I love the REI sourced shroud. What a day...I wanna hear these and the new giant Wilson. That would be a cool shoot out. Funny, my first thought was North Face tents caught in the wind. I was debating saying North Face or REI! This was new to me. From the descriptions in this article, all previous designs to control phase/response/timing etc. are woefully primitive by comparison. Given this technology and the inclusion of the amplification, the price seems reasonable. Some people worry that they would spend a lot of money on a product that drops drastically in price soon afterward, when they can't get a refund or adjustment credit. On that note, if this design were to catch on and "go viral" so to speak, there would have to be a few unhappy folks who bought the "other brand" for even more money than the 90. Conceptually sounds similar to the Kii Three, which is smaller and much cheaper(about $15k all in). Would be interesting to compare the two, or to the larger floor standers coming from Kii. The main emphasis with the Kii is the use of DSP to create a cardioid bass pattern so you get less room interaction in the bass. Other than that, it's a fairly standard design that uses a dsp crossover. The B & O is far more advanced in that it provides directivity control over the entire operating frequency range and allows a tremendous amount of versatility. It also has insane amounts of power behind it and large amounts of radiating area. Dynamics are incredible.And while the Kii sounds "ok" the B & O simply blows your socks off. 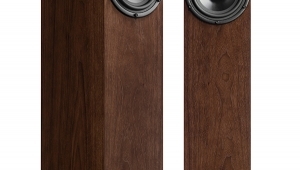 It's easily in the top 5 of the best speakers I've ever heard, and blows away any passive system I know of. B & O may have had a reputation for just being a "pretty face", but the Beolab 90 is something altogether different and IMO really points the way to how loudspeakers truly advance. It's about time. The loudspeaker industry has been basically "churning" for many years now with very little advancement. Wasn't trying to say the Kii is the equal. Was saying it is a similar concept for about 1/6 of the price. It might be a better solution in a small room. 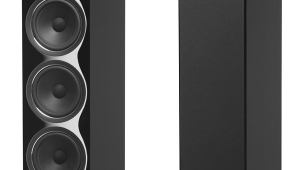 Calling it a "fairly standard" design is incredibly dismissive: how many standmount speakers do you know of that are full frequency range, contain 6 drivers, amps, and DACs, all controlled by DSP to enable time domain accuracy and limited interaction with side and front walls? Start naming your list of all those "standard" speakers....I'm waiting. Your dismissive comment about the Kii as being only "okay" is also sort of amusing, as so far both personal and professional reviewers have called it one of the best (note, not "the best") systems they've heard, equal to many at several times it's price. The apparent fact that it isn't as good as an $84000 system doesn't take away from it's accomplishments or the fact that it is revolutionary in its on right. And based on size and price, will probably end up in many more homes that the B&O 90. Nothing against the B&O, that's just reality. I've heard the Kii Threes, and they are absolutely astounding. All the things said in this review about presentation of recorded space etc. are true of them, more so than any other loudspeaker I've heard, and in a ridiculously small and efficient package (no peripheral DACs, amps, and the rest of the much-loved audiophile paraphernalia). I am going to arrange a demo of the BL90s shortly, if only to attempt to justify the Kii price ticket vs. the BL90s! I imagine every "true" audiophile will "automatically" remove those Geodesic Dome Grill cloths. The reviewer says they're "Handsome", I wonder if he's just being polite. B&O say's the 90s are beautiful in appearance. The people that buy these will probably have 5.1, can these be configured for the Video Theater Room? It's a nice Plus that they sound pretty darn good and saved their owner the extra $600,000 in cost of getting those new Wilsons ( not to mention all the additional electronics needed -- probably another 3 or 4 hundred thousand American ). Looks like the Ultra-wealthy have as many difficult choices as we the unwashed masses. ps. do they offer an optional Cat protector? Great write-up, and long overdue for a proper review of the Beolab 90. I'm looking forward to a full production unit being tested with all bells, and whistles up, and running. I'm looking forward to a full production unit being tested with all bells, and whistles up, and running. Our review was of a full production sample of the Beolab 90. Its control firmware was an early version. Yes. This unit was identical to what was being sold/installed to consumers at the time of the review and which we determined had all the features necessary to evaluate performance. While broad downward tilt 200-20k is a euphonious idea with almost any speaker, it is also highly dependent not just on room size and furnishings but also on horizontal radiation pattern. An extremely upper-mid- and treble-dispersive design like this one wants considerably less of it than other designs. Every Allison owner knows this (also perhaps Ohm, Shahinian, DA, BL5, and other owners), and this fact was pointed out by Julian Hirsch in the many reviews he wrote of dbx Soundfield designs, an earlier beamforming phased array (e.g. see www.hifi-classic.net/review/dbx-soundfield-100-135.html). Second, it is completely fascinating that the BL90 SP programs may not be perfected yet for lower-midrange balances and 'unrippling', i.e. the crucial half-octave above and the octave-plus below middle C. That is where boundary augmentation effects begin being *fractional* but are not yet summing coherently, of course. It is a problematic, dynamic area for most designs, work-aroundable only with some serious savvy. It will be interesting to see if BL90 future rev is able to improve supple handling of the two 90-360Hz octaves. Unless it was anomalistic in the setting. The only approach I have ever found that resolves the low mid problem that you so correctly describe with old-school technology is a large midbass horn - hardly practical for the average audiophile, unfortunately. The DSpeaker Anti-mode 2.0 does an admirable job, and I see no reason why the B&O engineers could not address the problem in a similar fashion. It would indeed be interesting to see if a later firmware load adds this capability. That is a very kind thing to say, but your first para indicates you did not understand what I wrote. Highly dispersive designs are exactly the opposite of directivity-controlled. It is with the former (and sometimes w/ planars) that a serious downward tilt is most euphonious on much program, to reduce the relative level of treble, though not its distribution in the reverberant field. 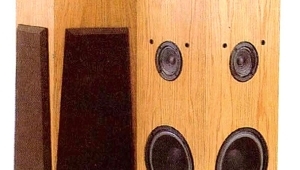 Beamy speakers, even in the new style of constant beaminess or at least uniformity (no stitches audible), if you tilt down their output, typically do not benefit at all; listeners say there are not enough highs. There are ways to overcome the Allison effect, as it is a near-corner-positional problem, a function of the distances, similar or hopefully dissimilar, meaning staggered, from the woofer to the three near boundaries. It does not require a horn or even a separate lower-mid driver. You can locate the woofer right near a boundary (or two, or three) but have it cover well up above middle C, like to 300-400Hz. Or you can suggest / enforce that its distances from floor, front wall, and sidewall are staggered 2/3/4 or 2/3/5'. Or, finally, since it is to first order independent of listener position (it is NOT related to room resonances), you can EQ it out with a canny bump to compensate for the inevitable lower-mid dip. Fwiw, JAtkinson is one of the very few reviewers to understand this problem well, and show it frankly in his room measurements. If you are willing to come out of retirement to afford a pair of these, give the Spatial Audio X1s (http://www.spatialaudio.us/x1-main) a review for comparison. A hunch - and a more elegant design philosophy and benign price tag - tells me the X1s could surprise you for a 7 times smaller investment, and keep you at home enjoying your well earned retirement. I'd personally hook them up to a pair of Benchmark AHB2s and a DEQX HDP5, but that's just me; I'm sure Vinnie Rossi's LIOs can do the trick for you, if you want have to go all in with the lifestyle kitsch of esoteric boutique components. I would very much like to see the Spatial Audio X1s reviewed and measured up against the megabuck flagships and emblems of the box-speaker paradigm. The reference to the Kii Threes in the comments certainly belongs in a more elaborate discussion surrounding the Beolabs and the design concept - and assumptions - behind them. 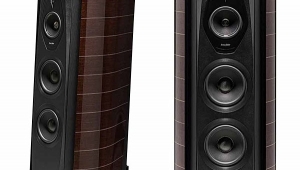 But so do the Grimm Audio LS1bes and a bunch of other speaker whose design have drawn and capitalized on the trajectory and explorations of Herr Linkwitz. It would be great to see more in-depth tech talk such as your succint introduction to the assumptions behind the Beolabs design, and how B&O and other manufacturers similarly frame the problems to be tackled by engineering solutions in speaker design... and less hype buzzing around mega expensive luxury objects. I totally agree with your reference to L'Arpeggiata & Christina Pluhar's recording with the fabulous alpha label, their amazing musicianship - and the recording quality - have provided a truckload of musical pleasure for years. Hah! It wasn't until I reached the antepenultimate paragraph that I was certain you were addressing me. The Spatial Audio X1s look interesting. I hope I can get an ear on them soon. I could not find anywhere the speaker's sensitivity 1w/1m? I think you're rather missing the point here - these are ACTIVE, DSP-controlled speakers with digital signal inputs i.e. contain many 1000s of watts of amplification and signal processing. 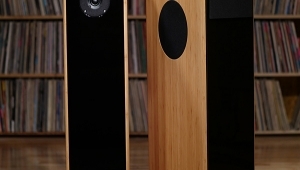 Sensitivity is only relevant when considering passive speakers that take amplifier signals and convert those directly to sound waves, and it represents the efficiency of that transducing function. In respect of value for money, it's worth reading the series of blog entries on their creation - http://www.tonmeister.ca/wordpress/2015/10/06/beolab-90-behind-the-scenes/. You might see that they are lot more than $3,000 worth of randomly clustered ScanSpeak drivers! Interesting. Controlled directivity has been an obsession of a certain section of the DIY community for a while now. As mentioned in some of the comments, Siegfried Linkwitz and his Orions and the the LX521 have aimed at providing this from bottom up through the use of dipole radiation. I had Orions for many years. They were wonderful. I also used DSP for crossovers and EQ. The sophisticated (at the time) possibilities helped, but you were still at the mercy of the room. It's why headphones sound so much better in most ways than speakers. The other issue with passive controlled directivity is that you are locked into a fairly narrow sweetspot. As a couch flopper, this became annoying. I somewhat solved it by using coax drivers so I get the same sound almost everywhere, but the room is still the biggest influence. Given the Beolab targets certain frequencies to cancel, I assume those frequencies are quite position-dependent. Certainly small movements of a mic can have major FR and phase differences. Was there a small sweetspot. I'd also be very curious what B&O can do with a simpler system. To a degree they are using acoustic cancellation (directed by DSP), but theoretically it is possible to manipulate phase and frequency entirely digitally. This is kind of what DEQX and Dirac promise, but don't quite deliver. Finally, I have to tip my hat to B&O. 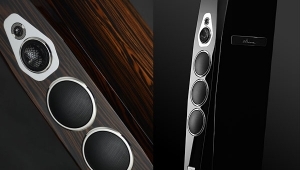 They ar isgnore by most audiophiles, but crate some extremely clever products. I bought my partner on of their tiny BeoPlay A1 speakers for Xmas and the sound quality is amazing for the size. I heard this speaker in Copenhagen at the B&O shop and it was truely a big experience. They are the best box speaker I have ever heard, that was not a horn speaker. Although they have some of the same qualities, as for example narrow dispertion, due to the DSP multi driver funktion. They also have great dynamics and are very transparent and accurate. My guess is, that the big so called high end brands are sleeping restless, thinking of the monster, B&O has brought to the battlefield.